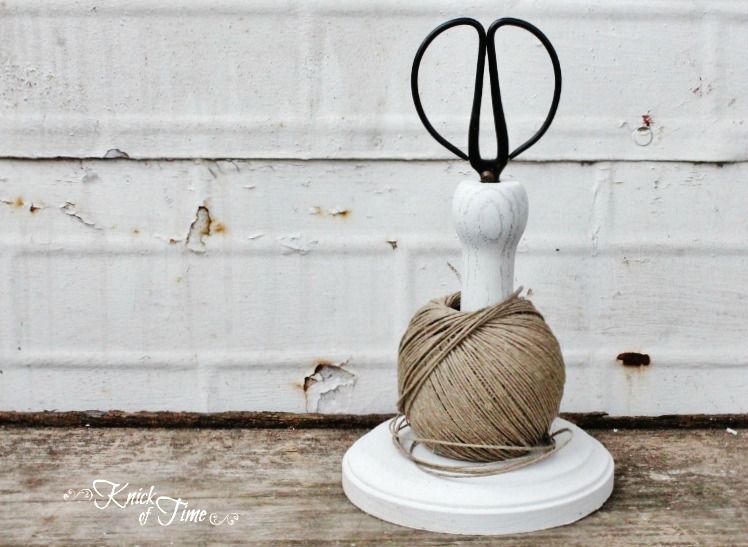 Wooden Twine Holder – Pinned and Done! I want to send out a heart-felt “thank you” to all of you who shared your stories, wrote well-wishes and are sending up prayers for my son while he’s at basic training. I had no idea so many of you have been where I’m at as a mom and have grown sons who’ve already been-there/done-that. It really does my heart good to hear your boys survived and are better men for it.Okay, enough about me! Do you have a mile-long list of projects on your Pinterest boards that you want to make? Mine is probably closer to 2 miles long, and I know I’ll never do them all, but when I discover I have most of what I need for a project – I’m all over it!Today’s “pinned and done” project is a wooden twine holder that I knew would be easy to duplicate. Here’s the inspiration photo that I pinned. I had a leg left over from all the chair projects I shared with you a few weeks ago, so I just bought a little round wooden base at Hobby Lobby, and screwed them together. I drilled a hole at the top for the scissors to fit in. Have you “pinned and done” any projects lately? Oh Angie, I really love this! The scissors is fantastic and I can only see the handles. Well that’s how to get it done! That’s awesome! I am addicted to Pinterest. I sometimes forget that I have saved all those good ideas. What a great idea and pretty simple to put together! I’ve just started attacking some of those pins I’m been meaning to get at. cute! I bought some of these wholesale to sell at my shop, but I must say, yours is just as cute! actually, I like the white a lot better! Nice job!! Cute idea and yet so simple. Love the finished result. Ok….. I have to pin it. I need this and I can do that too. That is cute. I’m going over to see your Pinterest boards right now. 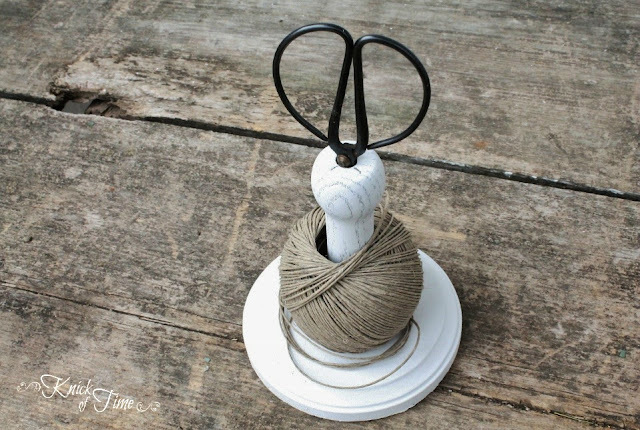 I love your twine holder/dispenser! I’ve pinned this, so perfect. Such a cute and handy project! Very clever! ADORABLE!!! Great little project. Sometimes those are the best kind! You are so clever, Angie! Just love this!! Thanks for sharing at Blissful Whites Wednesday!! Love your tutorial, very clever! So cute. Where did you buy the scissors? Barb, those are antique scissors that I got at an auction. Great idea! Love the look! I use a mushroom can wrapped with jute to put my jute in but I love this idea and having the scissors handy! What a great way to corral the stuff I always misplace! I LOVE to re-purpose and have a shop full of things waiting to be completed. I would rather spend my days doing that than going to work. But….life gets in the way of fun sometimes. Love your ideas.